The Strom Thurmond High School NJROTC Awards Ceremony was held on Monday, 29 April in the school gymnasium. 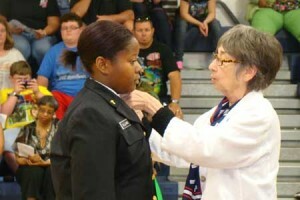 Ms. Sarah Sears, representative of the Old 96 District Chapter of the Daughters of the American Revolution (DAR) attended and presented the DAR Award for the 2012-2103 school year to second year Cadet Raven Williams. Cadet Williams has the highest GPA of any of the female Cadets in her class (2.64 on a 4.00 scale). She is a mature, responsible cadet who has been selected for accelerated advancement to the rank of Cadet Chief Petty Officer and placed in the position of a Platoon Chief Petty Officer. This position is usually held by more experienced cadets. Cadet Williams is active in NJROTC and in school activities outside of NJROTC. She frequently volunteers to help direct traffic for home football games and she also assisted with the NJROTC annual Thanksgiving Food Drive, in which frozen turkeys and other donated food items were collected and distributed to 41 area families in need. She is a member of the school’s Mock Trial Team, which recently competed in the state championships. 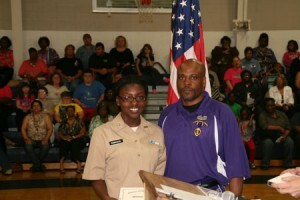 She is a well-rounded Cadet whose performance reflects well on herself, her family, and her school. American Legion Post 30 JROTC Military Excellence Award was presented by CDR Ken Hartkopf, USN (ret), Adjutant, American Legion Post 30. The American Legion Post 30 presents a medal, ribbon, and certificate annually to a cadet who demonstrates outstanding qualities in military leadership, discipline, character, and citizenship. 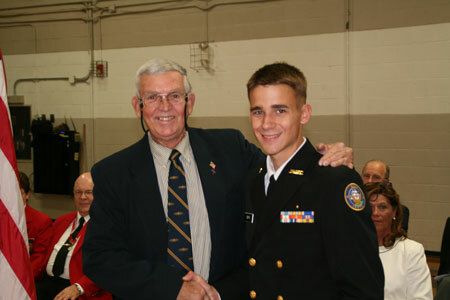 This year, the winner of the American Legion Post 30 JROTC Military Excellence Award is Cadet Noah Smith. The Military Order of the Purple Heart Award was presented by Purple Heart Awardee Mr. James Bates. The Military Order of the Purple Heart presents a medal, ribbon, and certificate annually to recognize an outstanding cadet in the JROTC program who demonstrates leadership ability, has a positive attitude toward JROTC, and excels academically in school. This year, the winner of the Military Order of the Purple Heart Award is Cadet Kaneisha Robinson. 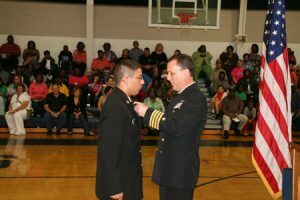 Captain Ken Gray presented the American Veterans JROTC Award on behalf of the American Veterans Association to Cadet Roberto Face. The American Veterans Association presents a medal, ribbon, and certificate to a cadet that demonstrates diligence in the discharge of duties and willingness to serve both God and Country for the mutual benefit of all.